Communication design is a fundamental part of building powerful products, and a key ingredient of communication design is illustration. Illustration helps shape the story of a brand and its products. Recently, Facebook’s In-Product Brand for Business team undertook an effort to adapt our consumer illustration style to our business needs. The exercise has grown into an effort that goes far beyond an updated visual style. In many ways it’s a transformation — and a long overdue opportunity to create a brand language that is inclusive of the beautifully diverse businesses we serve. By sharing some of the scenarios my team encountered and lessons we’ve learned in the process, we hope to open a dialogue at Facebook about representation, diversity, and inclusion in both our brand and our products. Brands have a huge impact on how we think and act. Before we’re old enough to go to school, brands help us understand the world around us, telling us where we (and others) fit in. Brands can make you feel successful, inspired, joyful, or any number of positive emotions. Unfortunately, they can also reinforce harmful stereotypes or even create new ones. A lack of diversity, inclusion, and representation is widespread and insidious. At Facebook, we know that brands can either contribute to stereotypes and underrepresentation or they can do something about it. We see designing diverse and inclusive illustrations as a chance to create a more welcoming experience for the people who use our products. Building a more inclusive illustration language at scale is a journey, and we still have a long way to go. We know it requires a concerted effort and a rewiring of biases — some that we might not even know we have. But remedying a systemic lack of inclusive representation will not happen by accident. We must commit to critically examining the way we tell stories with illustration. It’s important that I acknowledge that as a white male, I do not regularly experience most of the types of exclusion and prejudice I’ll be referencing here. But creating a more inclusive brand, workplace, and world is not just the burden of the underrepresented — we all have a responsibility to improve pervasive inequities. Where Facebook’s In-Product Brand for Business team has the power is in the way we tell stories as a brand. It’s each person’s responsibility to shed light on this sort of inequality and fix it where possible. A diverse illustration can fail to be inclusive. While diversity is quantitative (in other words, the number of people at a company, on a team, or in an illustration), inclusion is more about how those represented feel. Being there is one thing. Feeling like you belong there is another. This concept is nothing new. Nevertheless, knowing that diversity is only a part of the equation challenges us to think more deeply about the stories we are telling. Everyone in an illustration should feel productive, creative, and collaborative. No one illustration is going to make or break the brand, but added together, these decisions define who feels included by our brand. Both of these illustrations show balanced diversity, but the illustration on the left conveys an unbalanced power dynamic wherein a white male scientist explains information to a passive woman of color. On the right, with the narrative flipped, we’ve moved the underrepresented character into the position of authority. Metaphor is core to illustration. Think of a lightbulb to represent an idea or a plant to represent growth. Metaphor can take an abstract or complex topic and make it simple and relatable. In doing so, they help people understand the concept quickly. This practice becomes very problematic, very quickly when it’s applied to the characters and roles in an illustration. What does a CEO look like? Who is an engineer? There aren’t quick answers to these questions — and there shouldn’t be. We have to challenge our mental defaults in a big way. These defaults develop over time, often because of the imagery that surrounds us. But as creators of our visual environment, we have a responsibility to question these preconceived ideas. We must actively address our own biases and recognize what the common depiction of a certain role might be. An internet image search can be a good (but usually sad) place to start. It’s hard to see anything but a wall of white, male developers — a pretty clear indication of the widespread bias that engineers are white men. This bias actually does reflect the reality of the industry, but it’s also a self-fulfilling prophecy: These images reinforce entrenched ideas. Identifying these biases is the first step to disrupting them. Some would argue these defaults don’t have a negative effect on the average person. Not true. Anyone who is not white or male and using Google to, say, write a report on computer science does not feel welcomed in this field. These biases can show up when there aren’t any humans in an illustration at all. For example, when we use a tie or briefcase to represent businesses, we’re saying that the world of business is male by default. Some may ask if it makes sense to purposefully depict a female CEO or intentionally show a person of color leading the group. The answer is yes. If we don’t actively challenge these defaults, we are giving them strength. We must bring a balance to something that has been unequal for a long, long time. Illustration that consciously challenges stereotypes might not reflect our reality today, but it asserts that the future can be better. As designers, we employ empathy to help us create engaging and useful products. We put ourselves in the shoes of our users, and in this way we try to predict who will interact with our designs and how they will do so. But in brand design, we must be careful to focus on broadening our audience rather than catering to it. To use the example above, rather than creating work that appeals primarily to white male engineers, we should create work that seeks to pull in new and diverse perspectives. We must acknowledge our assumptions about our audience and then challenge those assumptions. Remember that in conducting user discovery through personas, personas describe needs and motivations, not people. Biases, whether conscious or not, can limit who you are bringing into the conversation in the first place. Test your preconceived ideas for what actions are taken and by whom. In terms of branding, our diversity and inclusion efforts so far have been very U.S.-centric. Like many companies based in the United States, representing global values is an area where we have room to grow. By placing an emphasis on Western-style clothing, architecture, and businesses, we are alienating a huge portion of the people who use Facebook. In so many ways, people living in other countries experience our products as second-class citizens because our communication design does not help them see themselves in the stories we tell. Taking on this problem is an enormous task. We believe it’s one worth tackling, and we are excited to focus our efforts on creating a truly global brand. Many technology brands, including our own, have explored simple ways to incorporate diversity and inclusion. We tried a solution in which we homogenized the characters in our illustrations so that they almost appeared without race or gender. Our takeaway was that this approach failed to make our brand more inclusive. That said, our aim is to start conversations about how we can build more inclusive and representative tools, so it’s instructive to see the degree to which attempting to avoid the problem doesn’t solve it. If you think making all illustrated characters blue is a convenient way to get around asking some difficult questions, it isn’t. In fact, it’s incredibly problematic. Our brains are already prone to bias and will likely be happy to go along with the assumption that a group of blue characters are all just different shades of white. Beyond that, blue skin has different meanings in different cultural settings. In some countries, blue skin represents zombies; in others, it’s used to denote gods. To be truly inclusive, we should be sensitive to these differences. Illustration is a creative practice and there is room to explore stylistically, but it is important to remember that this does not excuse the responsibility to create a diverse and inclusive narrative. In Facebook business illustrations, we use a broad, warm, gray palette for skin tones that is capable of showing both lighter and darker skin tones. While our palette is still limited, we have taken special care to create enough contrast that we’re able to celebrate differences in skin tone. Having the ability to show different skin tones doesn’t solve everything, but it has given us a much more solid foundation on which to build. Adding moments of reflection to our roadmap. We have built periods of thoughtful discussion into our workflow for every project. These moments of pause allow us to take a critical look at our progress toward building more diverse and inclusive illustrations. Right now, this is still pretty new for us, but eventually it will become second nature. Expanding our illustration language. We are actively creating more characters, clothing, and objects so we can pull from a library that reflects an inclusive storytelling philosophy. We want to create an illustrated world that’s as dynamic and vibrant as the world at large. This requires us to put in the work to depict different cultures, gender expressions, religions, ages, abilities, lifestyles, and more. 3. Expanding our mandate. It would be a missed opportunity if we didn’t share our learnings across the company. To this end, we are working on building a set of modular, compassable illustrations for our design partners across Facebook. If we can build a balanced set of characters and locales, it will be that much easier to create inclusive imagery. As designers, we aren’t just reflecting the world around us, we are helping to build it. Not enough has been done in the past to address this responsibility, and it’s up to each one of us to change that. We know this effort is never done and that we face challenges that cannot be easily overlooked. The reality is that we work in an industry that is especially unbalanced, and illustration alone cannot change that. Still, each opportunity to create a more inclusive and welcoming experience for the real people who use our products should not be underestimated. By starting conversations, building better tools, and thinking more critically about the role we play, we may just inspire others to do the same. 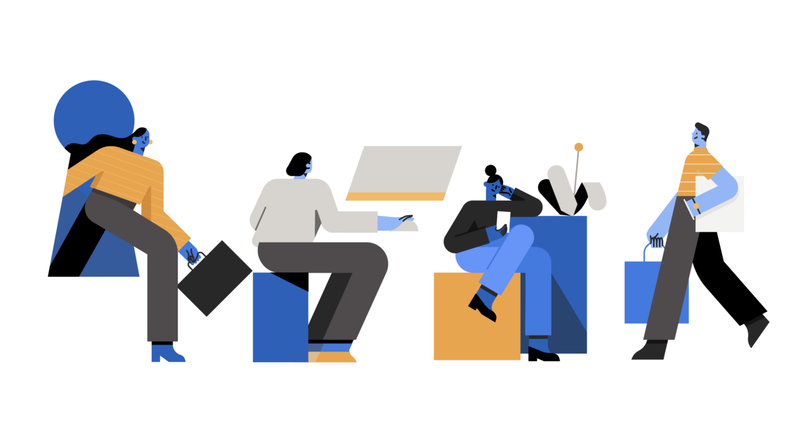 Illustration is one of our primary brand languages at Facebook, and in consciously applying a diversity and inclusion lens, we hope we’ve made Facebook a more inclusive place overall. We also hope we’ve helped others think about embarking on journeys of their own. Article Illustrations Designed by Trace Byrd for Facebook, Inc.